Almost every day I’m exposed to new dishes. Throughout my career I have collected those recipes which I really love and I add them to my repertoire. This is a dish I tasted during a photo shoot for “Al Hashulchan” Magazine (Israel’s leading culinary mag), on the topic of Israel’s north food culture (be it a very small country, but there is quite a difference in food per region). Chefs from all over Northern Israel gathered at the Mizpe Hayamim (a beautiful hotel, spa and organic farm) and brought with them their signature dish. My favorite dish from that day was definitely this recipe made by Anat Otolengi of the Scots Hotel in Tiberias, Israel. Rotem (Al Hashulchan stylist) and I were enjoying every last bite of this dish and since then I’ve make this recipe at least once a month. This dish really makes an impression on people a. because it looks really good and b. because it tastes really good- so I tend to make this dish when I need to do some showing off in the kitchen. 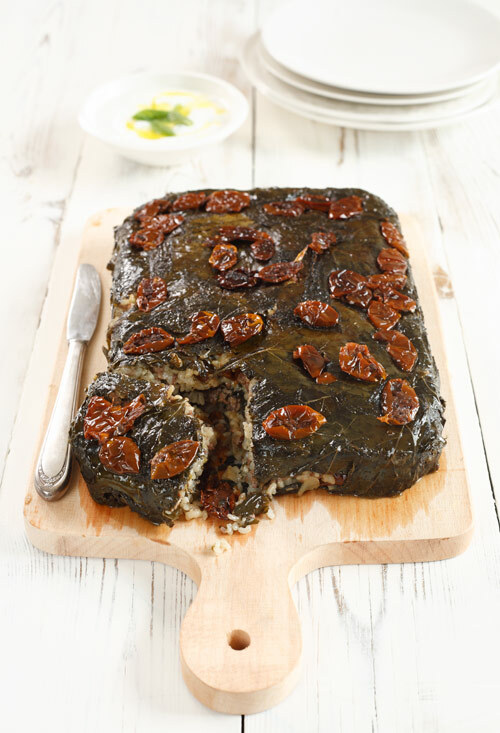 The best part about this dish though- is that it’s really easy to make- you don’t have to sit in the kitchen for hours rolling grape leaves- 20 minutes and this bake is in the oven. Deanna’s side note- I’m not a huge fan of stuffed grape leaves, but since we photographed (and ate) this dish, I’ve made it twice in one week, and the ingredients are waiting for me in the fridge to make it again. I made it for a Friday night dinner and it was a huge hit. Using a strainer, pour hot water over grape leaves and then wash thoroughly with cold tap water- (this will help them separate and get rid of the brine taste). Make the filling: on medium flame, heat the olive oil in a large skillet and add the onions and cook for about 7 minutes, until golden. Add the garlic and cook for another minute. 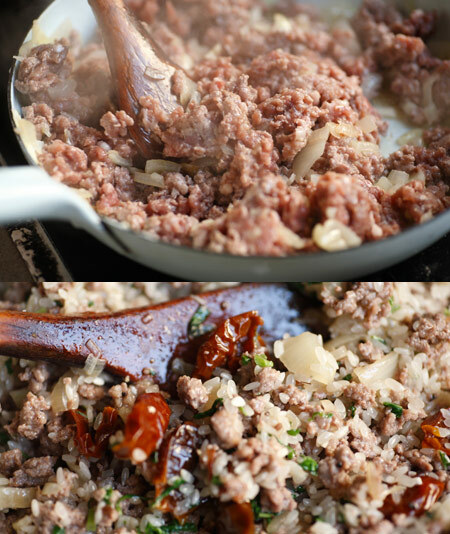 Add the ground beef and cook until browned. Season with salt and pepper. 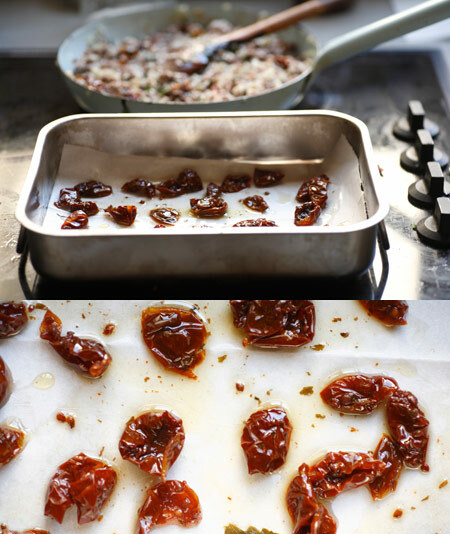 Add the rest of the sun dried tomatoes and pine nuts and mix together. Add the chopped mint and rice, cook while stirring occasionally until the rice becomes translucent (about 5-7 minutes). Remove from heat. Assemble the dish: line the bottom and sides of the baking dish with a layer of grape leaves (making sure that their pretty side, without the “veins” is facing down). 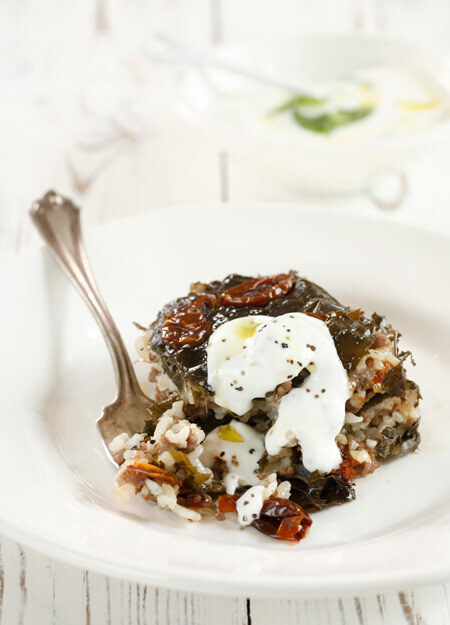 Pour in half of the filling and line again with a layer of grape leaves. 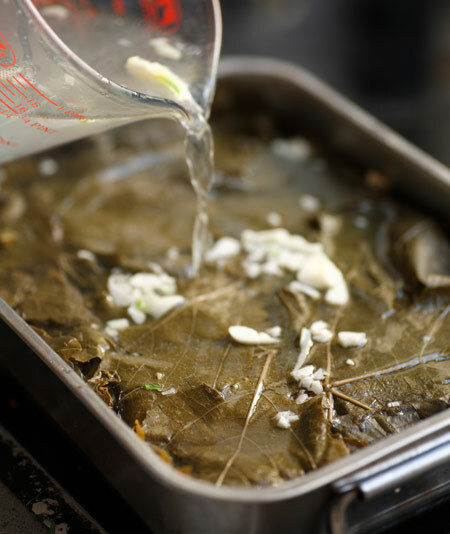 Add the rest of the filling and line again with grape leaves, this time let the grape leaves go over the sides of the dish and then fold them in so that all the filling is covered. Make the sauce: bring the water to a boil in a medium saucepan and add the lemon juice, olive oil, garlic. Season to taste with salt and pepper. Pour the sauce over the dish and cover with aluminum foil. Bake for 1 hour. Let cool for 15 minutes and then flip the dish upside down onto a serving plate. Just found your blog. Love it! Especially this dish! Your photography is so perfect and wonderful. The recipe is such another winner! I never think of making domale this way. Fantastic! Thanks Anh and Maria- look forward to hearing about how it comes out! This is good stuff. I am always looking for such great content to forward to my readers. looks beautiful! how would you do a vegetarian version? Danya says: For a vegetarian version add some chopped tomatoes and dried cranberries. You can increase the amount of rice according to the size of your bake. Remember- the amount of water is double the amount of rice. Deanna: Thanks Y.. love your work as well. Finally I managed to cook this wonderful dish! I made it without the meat and it was a winner! Damn, it looks so delicious! Can’t wait to try it out!